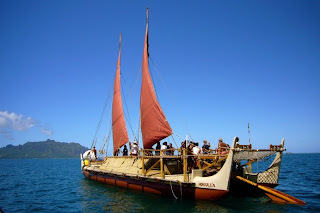 Something you will read about: Hokule'a: a double hulled canoe. 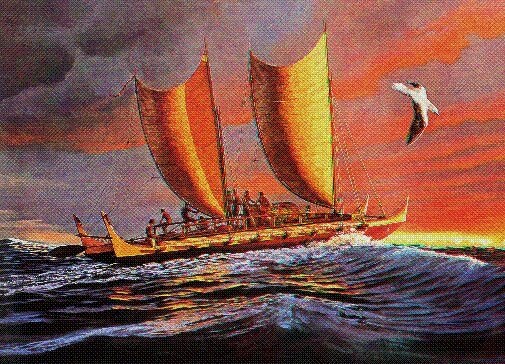 The Hokule'a would travel across an ocean and into the past. A steady, invigorating sea breeze forced the crab-claw sails to billow out and propelled the strange-looking boat swiftly across the turquoise waters. The seventeen men aboard the curious vessel anxiously anticipated the excitement of the voyage as the Hawaiian Islands faded in the distance behind them. Ahead, on the horizon, the sea met the sky and the two shades of blue melted together into a single hue. Some of the voyagers were of Polynesian ancestry and, for them, this would be a journey into their past, as well as across an ocean. Although the boat was equipped with a few modern devices, its design and appearance strongly resembled the canoes used by their ancestors. And, like their ancestors, these men would rely solely upon the sun, the stars and wave patterns to get them to their destination: the island of Tahiti. The boat was named the Hokule'a or "Star of Gladness," after the brightest star that shines over Hawaii. And it would be by this star's light and position that they would be able to guide themselves across the Pacific. Their trip would take them across approximately three thousand miles of open sea and would take several weeks to complete. There were many reasons for the voyage and the decision to make the trip was a unanimous one. 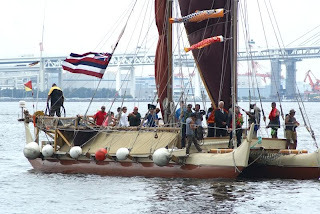 It was hoped that the voyage of the Hokule'a would bring the past and the present together by stimulating a modern generation's interest in their heritage, and reviving the traditions and customs of a once flourishing people. Most modern native Hawaiians knew nothing of the ancient ways of life, especially boat building, navigational methods, and preserving food. The voyage of the Hokule'a hopefully would whet their appetite to learn these almost forgotten techniques and stimulate a sense of pride, in their heritage, not only for Hawaiians, but for all Polynesian peoples. Furthermore, some of the men aboard the Hokule'a were archaeologists and were hoping to answer a scientific question. There was some speculation that the ancient Polynesians had periodically journeyed throughout the Pacific expressly in search of new islands to inhabit. But, unless this could be proven, the skeptics maintained their perspective that the islands were discovered accidentally, since the trade winds were so strong they would prevent the ancient Polynesians from returning to their home ports. Although the actual journey would be made by seventeen men, it was really an all-island project. Provisions were supplied by Hawaiians of all ages who had to learn the age-old techniques of sun drying fish and preserving fruit, especially bananas, to make a natural, high-energy candy. Finally, on the afternoon of May 1, 1976, the shell trumpets sounded, echoing through the hills, and announcing that the Hokule'a was on its way, sailing with the hopes and dreams of an entire people. Aboard the Hokule'a were two very essential, but unusual, passengers. One was Maxwell the pig and the other was Hoku Li'i Li'i, or Little Tiny Star, a small honey-colored dog. It was believed that the ancient Polynesians carried animals and plants on their voyages and Maxwell and Hoku would help scientists learn how easily animals could adapt to and survive under unusual conditions. Hoku was also very special in another way. She was specially bred with the characteristics of ancient Polynesian dogs that ate only vegetables and never barked. Within a few hours of their departure, darkness approached and some of the men wrapped themselves in extra canvas sails and settled down in the hulls to sleep, while others put up hammocks underneath thatched shelters. No matter which location they selected, they quickly discovered that they were going to be wet. The Hokule'a was sturdily built, but spray pounded her constantly. One person who would have little opportunity to relax that night was the boat's navigator, Mau Piailug. He sat in the stern of the boat, the keen eyes in his craggy face concentrating on the waves. Piailug was one of the few people in the modern world who was familiar with the ancient Polynesian techniques of navigation by natural phenomena; techniques he had studied since he was a boy. Neither Piailug nor his assistants would use any instruments other than their physical senses and their common knowledge of navigation during the voyage to Tahiti. Most of the men had confidence in Piailug, but there were a few who were relieved to see the Meotai, a larger boat with modern equipment, which followed behind them and could be contacted in case of an emergency. 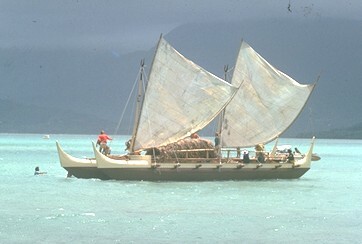 Most of those aboard the Hokule'a were veteran sailors and found they had no problem at all acquiring their "sea legs." Unfortunately, for some it was not so simple. Maxwell, for one, found the constant rolling motion of the waves too much to bear and he was quite miserable the first night. However, by the second day out, he had grown used to his new environment, finding the sea air most invigorating. The sailors, too, whet their appetites at the thought of their first breakfast at sea: eggs cooked in coconut shells, and sweet potatoes boiled with coconut milk. As part of the experiment, the men agreed to eat only foods that the ancient Polynesians would have. So far, the limited diet seemed no hardship. 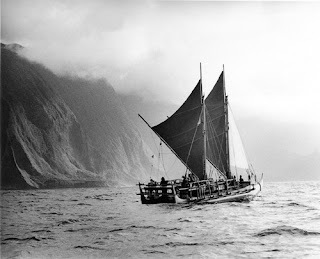 For the first two weeks, the Hokule'a made steady progress, but then the winds subsided and only occasional breezes filled the sails. The men quickly learned to be patient and even attempted combining recreational activities with their chores. Swimming and diving became two of the most popular pastimes and even scraping the hulls free of barnacles was made into an enjoyable detail. One day, however, one of the crew spotted several sharks near the boat and from then on the crew's recreational activities were confined to the boat. The frolicking and joviality wore off quickly, however, as being cramped together in such close quarters soon reduced the crew's better natures. The calm seas and incessant sun didn't help the situation either. Tempers grew short and the men soon disagreed loudly about the management of the expedition and about the importance of completely following the ancient ways. Some crew members, led by Piailug, insisted expressly on adhering to the original conditions, but others decided they had consumed enough dried fish and coconut milk to last the remainder of their lives, so they petitioned the Meotai to supply them with rice, flour and corned beef. Life was sometimes difficult for the animals, too. The unrelenting sun burned Maxwell's skin severely, and the sea air had an all too invigorating effect on his appetite. First, he ate most of his bamboo cage and then, when the men used a canvas sail to protect him from the sun, the greedy pig ate the sail as well! Needless to say, Maxwell had a terrible case of indigestion for several days as a result of this escapade. As for Hoku, some large sea birds frightened her one day, and the previously silent little dog suddenly discovered to everyone's amazement that she could bark! Finally, with the help of more favorable winds, the Hokule'a sped along once more towards her destination. After almost one month, the men heard the sounds of birds overhead. Piailug recognized the species as one which never flew far from land and he informed the men that their journey was almost at an end. They reached the island of Mataiva on June 1, 1976 and less than one week later, on June 4, they arrived at their destination where hundreds of Tahitians had gathered to welcome the weary but jubilant travelers "home." It was recognized that the voyage honored the traditions and the history of all Polynesian peoples. But the adventure was an achievement from other perspectives as well. It was a successful attempt on behalf of man to become reunited with nature; not as a conqueror., but as a companion; working with nature, not against it. The observations and data that was recorded by the Hokule'a's crew in the style of the ancients, matched the information gathered by the Meotai almost identicallly. To be sure, this adventure into the past would become an important chapter in Polynesian history. b. was a large steamship. c. resembled a primitive canoe. d. was a type of motor boat. a. over three thousand miles across the Pacific Ocean. b. less than two thousand miles across the Atlantic Ocean. c. over four thousand miles across the Atlantic Ocean. d. approximately ten thousand miles across the Pacific Ocean. 3. According to the story, which of the following statements is not true? a. Piailug navigated the boat using natural phenomena. b. There were sharks in the waters where the Hokule'a traveled. c. Everyone had a great deal of confidence in Piailug. d. The trip was constantly difficult for the animals on board. a. Tahiti to the Hawaiian islands. b. Africa to the United States. d. the Hawaiian Islands to Tahiti. a. to show that small boats could not withstand shark attacks. b. to test mens' behavior at sea for many weeks. c. to revive interest in Polynesian culture and history. d. to study certain dangerous wave patterns. a. was made up of foolish men using foolish ways. c. wanted to disprove the data gathered by the Meotai. d. should be respected for their determination and resourcefulness. a. the winds subsided and it became more difficult for the men to maintain their good morale. b. the Meotai had engine trouble and had to return to Hawaii. c. the men hunted sharks for food and ate them raw. d. the strong sun spoiled all the fruits and fish. a. showed that animals cannot be transported by boat. b. proved that men can work with nature to accomplish almost impossible tasks. c. brought fame to the historians of the world. d. showed the world the necessity for modern technology in ocean travel. a. "An Eye Toward the Future." c. "A Journey Into the Past." a. the dangerous winds in the Pacific Ocean. b. scientists studying a culture. c. the importance of a people's ancestry in their lives. d. learning to adjust to difficult times.